Nice is one of the most attractive tourist destinations of France. It is a beautiful city situated along the French Riviera. If you would like to visit this wonderful city, choose the following deal offered by Aeroflot. It is a very cheap flight from Atlanta to Nice for only $1,031 r/t. The flight departs on April 15, 2014 and returns on April 22, 2014. Spend a fantastic week in the city of Nice and have an unforgettable holiday. I suggest you to make your booking as soon as you can, because such cheap tickets are always sold quickly. Use the following box to search for this flight. You can also book it via the box. Besides, you can check other 3-4 providers and even compare the prices offered by them with the price offered by Aeroflot. You will fly from Atlanta Hartsfield Airport (ATL) to Nice Cote Dazur Airport (NCE), departing on April 15, 2014 and returning on April 22, 2014. The price of a ticket is only $1,031 r/t on Economy class. 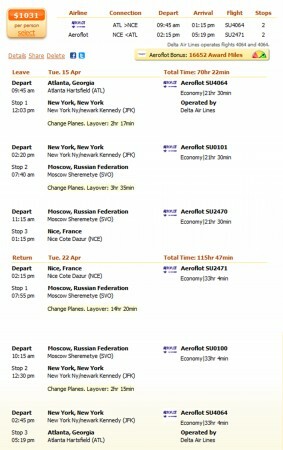 The flight has two stops both directions, one at New York Ny/newark Kennedy Airport (JFK) and one at Moscow Sheremetye Airport (SVO). The total travel time is 70 hours 22 minutes on the way to Nice and 115 hours 47 minutes on the way back to Atlanta. You will notice these details if you check the screenshot below. 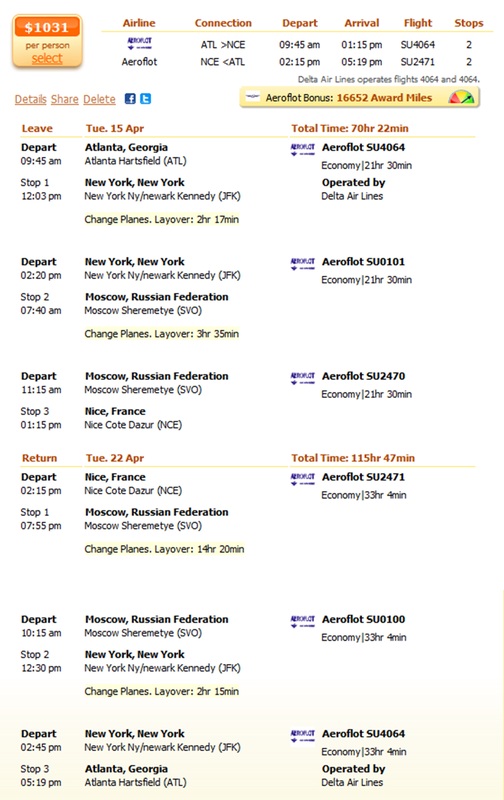 The next cheapest airfare is 21% more expensive than the one offered by Aeroflot. This flight is operated by Brussels Airlines and it costs $1,302 r/t. In this case the flight has also two stops both ways, one at Washington Dulles Airport (IAD) and one at Brussels Airport (BRU). The total flight time is 21 hours 15 minutes on the way to Nice and 18 hours 5 minutes on the way back to Atlanta. You can check other 3 providers’ prices in the table below.